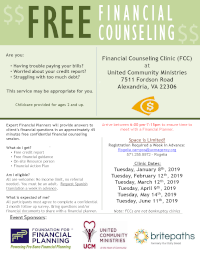 Britepaths partners with United Community Ministries in the Alexandria area, and Western Fairfax Christian Ministries, Ox Hill Baptist Church and Fairfax County Neighborhood and Community Services in Western Fairfax, to bring Free Financial Counseling Sessions to low- to moderate-income adults. Volunteer Financial Planners will help adult individuals tackle a pressing financial problem. The volunteers will provide a one-time, 45-minute session to help clients examine their immediate financial situation and help them create a course of action to address concerns. Britepaths' Financial Counseling Clinics are made possible through a grant from the Foundation for Financial Planning. Special Offering: Northern Virginia Housing Expo, Mar. 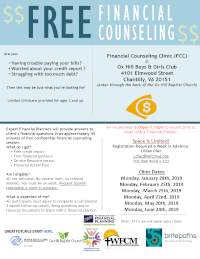 30, 10a-3p in Arlington: Free Financial Counseling Sessions and many resources! Please register one week in advance! Spanish translation available, please email or call to request. Child Care Provided! Please register one week in advance! Spanish translation available, please email or call to request a week in advance. Limited Child Care Available for children age 2 and up. If you work with low- to moderate-income families, please let them know about this great resource! Contact: Carole Rogers at crogers@britepaths.org or 703.273.8829 ext. 504 with questions about the program. Additional Resource: Britepaths offers Financial Coaching by appointment, in addition to financial literacy and life skills classes and workshops, workforce development, tax and small business assistance, and more, at the Financial Empowerment Center at South County in Alexandria, through a grant from the United Way of the National Capital Area and Fairfax County Neighborhood and Community Services. Learn More about the FEC at South County's offerings at: FECSoCo.org.